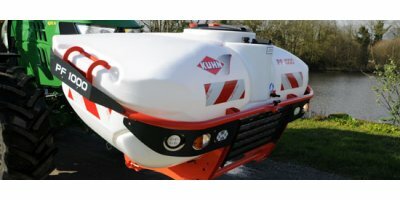 Kuhn - PF SELECT 1000 - 1500 - Spraying- Integrated Sprayers - Integrated Sprayers by KUHN S.A. Lacking in autonomy? An excellent solution is the PF front sprayer. It increases the productivity of a mounted sprayer as well as balances out the load on the tractor while remaining exceptionally compact. This sprayer offers excellent handling and increases output to the equivalent of a trailed or self-propelled sprayer. Combined with the ALTIS 2002, this spraying duo reaches a record capacity of 3,500 liters (3,940 actual liters). Dead space is minimized with the single pipe that links it all together. PF SELECT has a similar design to the PF with neither pump nor set-up. It comes in 1,350 and 1,850 actual liter capacity versions. With its simple finish and functional design, the PF SELECT is a highly economical solution for transporting additional clean water or liquid nitrogen. Its simple purpose is to make each trip during a spraying operation as productive as possible. It has a cradle-shaped design in machine-welded steel, to provide a secure fit for the 3 tanks; main tank, rinsing tank and hand-washing tank. Storage compartments are among the numerous advantages that come as standard equipment. Rear transfer is carried out with a single pipe reducing dead space. A wide range of optional equipment is available. Visit our website to discover our full line of products available in North America: http://www.kuhnnorthamerica.com/us/products.html. Don't forget to subscribe to our YouTube Channel to receive notification when we post new videos. You can watch, like, comment and share these videos with your friends. KUHN GRASSMASTER : Simply Great Forage ! We want to share with you our know-how for obtaining forage of higher quality. No reviews were found for Kuhn - Model PF SELECT 1000 - 1500 - Integrated Sprayers. Be the first to review!